Against the backdrop of the shock announcement that central government are set to give Leeds a third less funding than anticipated for the new Clean Air Zone, south Leeds residents have now publicly launched a campaign for their communities to be included back into the plan – and insist that the recent government decision makes their case all the stronger. 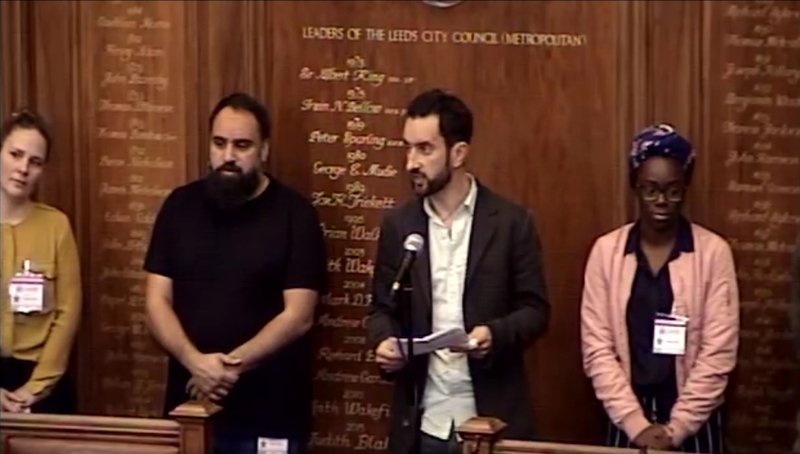 Specifically, a group of residents – going under the name Clean Air South Leeds – yesterday (Wednesday 14 November 2018) gave a ‘deputation’ speech before the whole Leeds City Council. In a five minute speech, they challenged the exclusion of their communities (the whole of LS10 and LS11, including Middleton, Belle Isle, Hunslet, Beeston, and Holbeck) from the proposed Zone. They insisted that south Leeds needed the scheme more than most places – with already high levels of respiratory illness, issues relating to local deprivation, and lower life expectancy. They argued against the decision to prioritise the rights of industrial traffic (HGVs etc) over the health of local residents – and expressed concern that the proposed zone would actually increase heavy vehicles locally, as firms relocate out of other parts of the city. But recognising the need to compromise, they requested that LS10 and LS11 be included in the zone after a two-year delay – to give businesses the chance to adapt their fleets. Following the speech, the campaigners met with councillors – themselves reeling from the news that central government are offering a third less money to the overall scheme than previously anticipated. The residents were promised further meetings, with councillors and council staff, to look at working together to make sure that LS11 and LS10 don’t lose out. The proposed Clean Air Zone is a key element of the City Council’s response to a government directive to reduce air pollution in Leeds – which has some of the highest levels of air pollution in the UK. It will see many commercial diesel vehicles charged to enter a zone, and is due to launch in early 2020. Initial proposals included south Leeds – but mainly due to pressure from industry, LS10 and LS11 were excluded from the final version, which was signed off by the Council’s executive board last month. Following the deputation speech the Council agreed to refer the matter to the Director of Resources and Housing for consideration, in consultation with the relevant Executive Board member. You can watch a video of the speech here as part of the webcast of the whole meeting. The speech starts at 0:28:15 into the video.